Vous souhaitez poser une question à l'établissement The Rich Hotel ? 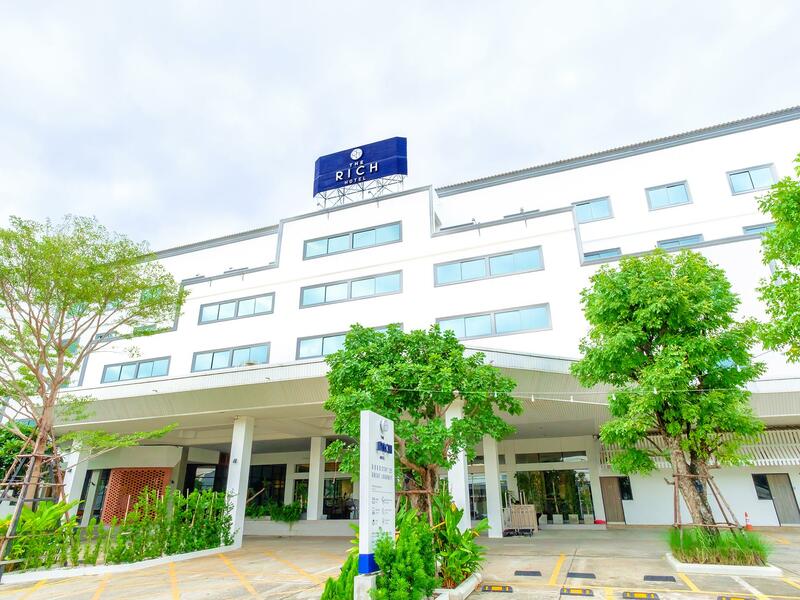 Très bien situé à Nakhonratchasima centre, le The Rich Hotel est le point de départ idéal pour vos explorations de Nakhon Ratchasima. De là, les clients peuvent facilement se déplacer et profiter de tous les avantages offerts par cette ville dynamique. Havre de sérénité et de détente, l'établissement permet au hôtes de se ressourcer à seulement quelques pas des nombreux centres d'intérêt de la ville tels que Hôpital de Maharat Nakhonratchasima, Stade municipal, Hôpital Saint Mary. À travers ses services de qualité et un vaste éventail d'équipements, le The Rich Hotel s'attache à rendre votre séjour aussi agréable que possible. L'établissement donne accès à un vaste éventail de services, dont service en chambre 24h/24, WiFi gratuit dans toutes les chambres, ménage quotidien, laverie automatique, sécurité 24h/24, pour n'en citer que quelques-uns. Les clients peuvent faire leur choix parmi 160 chambres qui respirent toutes la paix et l'harmonie la plus totale. Une ample gamme d'installations de loisirs, dont massage, est à disposition dans cet hôtel. Grâce à un emplacement exceptionnel et des équipements hors pair, le The Rich Hotel vise juste sur tous les points. Le tarif de toutes les catégories de chambre comprend un petit-déjeuner valable pour 2 personnes à l'exception des chambres de catégorie Lit Standard Simple. Le tarif des chambres de catégorie Lit Standard Simple comprend un petit-déjeuner valable pour 1 personne. Large room. clean and good location. Had a pleasant stay there. Room is huge and clean. Bath tub in bathroom is an added touch. Good buffet breakfast although choice is limited. Many channels on TV but English channel is non exsistence. Good location with good parking place. For the price you pay, it is value for money. Will come back again. 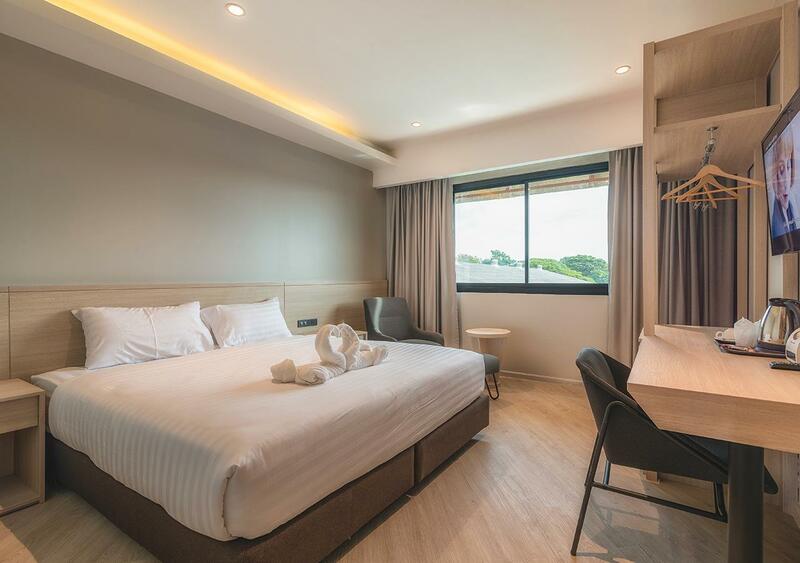 room was cleaned whenever I wanted, fridge was on and 2 free waters every day, warm running water with backup electric shower, real bathtub, good size room for 500 baht, lcd tv, big bed, cannot fault the hotel to be honest! This is a good place to stay if you have a car and don't want to spend all your budget on hotel bills. The room is large and clean. The bed was big and quite hard. The shower had unlimited hot water. The room did smell a bit of cigarette smoke at first, but as it had a large window it was easy to let fresh air into the room and the smell soon went. The hotel staff are friendly and helpful, especially in the restaurant. There's lots of parking at the front of the hotel. Breakfast was fine - not a 5-star banquet but then hey what do you expect at B 550 for a night! Not a great choice if you don't have a car. But it's 'slightly out of town' location means you avoid the big traffic jams in the city centre! Quiet Hotel in the Big City! beer bar next to hotel really loud until 4 am! painful, sleepless night. asked for a quiet room at the desk, and in my booking too. when i checked into my room, i saw the beer bar across the way - returned to the front desk and asked if there was loud music from the bar. they lied to my face and said "no, there is no loud music from that bar"! the pounding loud music went on until 4am. i hate not sleeping all night, but when the front desk lies to your face and causes you a sleepless night, just so they can collect their $, i really see red. there is a whole row of rooms facing this loud bar. no cockroaches in the rooms, but you'll find them behind the front desk. Have been staying in this hotel many times. 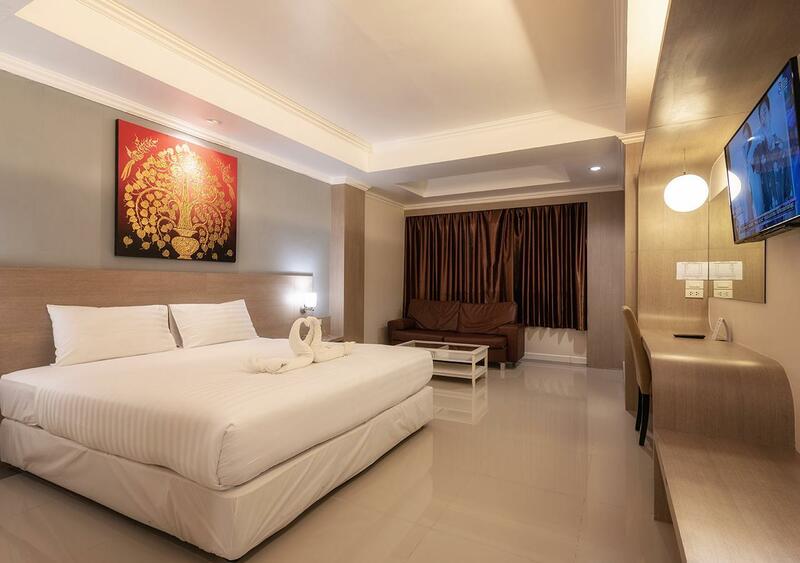 Location is good, near to street food and very nice clean room. For the price you pay, it would not go wrong. Cheap, value for money. 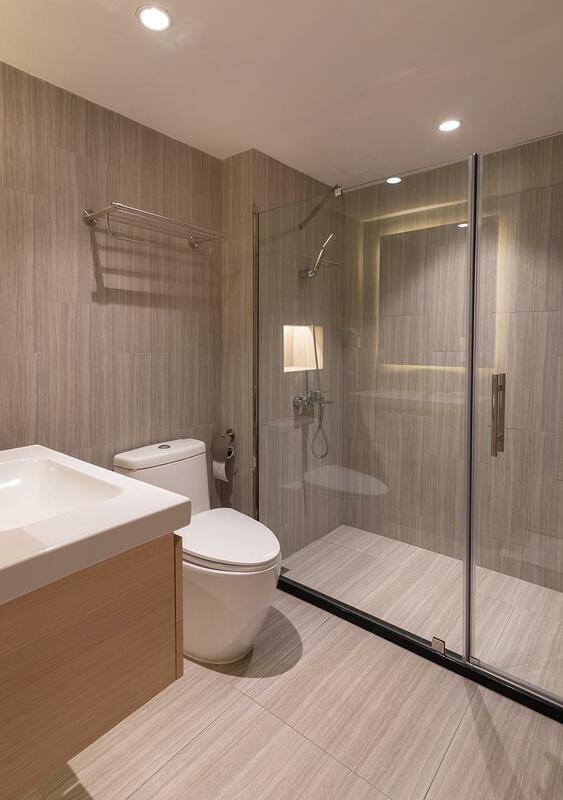 Even standard room have a bath tub. Will always stay there again whenever I am in Korat. A short tuk tuk ride from the main korat bus terminal having arrived from mo chit, bangkok had me entering through large glass doors into a large hotel recpetion area. 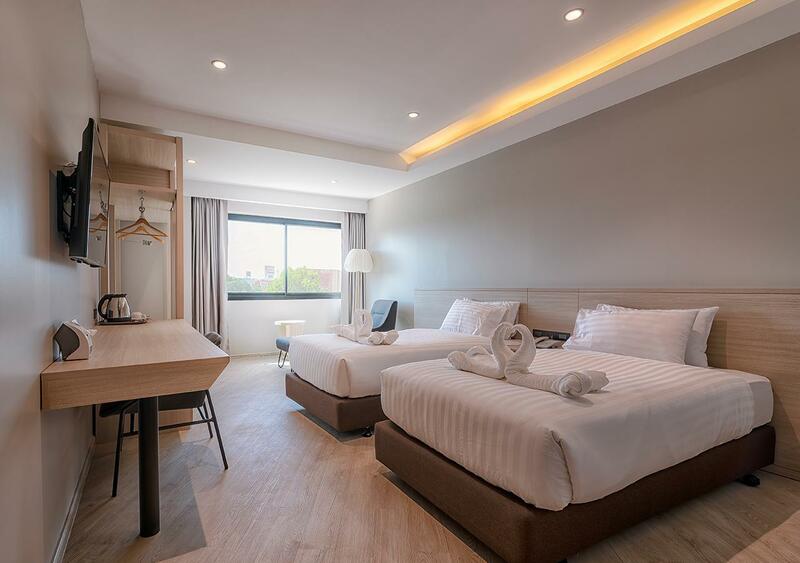 check in was swift, i was expected, i was shown to my room, a lift, wide corridors, clean and spacious, room and bathroom large and comfortable, not 'luxury' but what is. I popped out for something to eat and a few beers at an open air restaurant about 30m up the road then back for a good sleep on a huge bed. I think there was a bar right next door just passed the hotel which looked quite lively where i could have sought some company but was to be seeing my girlfriend the next day so behaved myself admirably. The hotel is situated on a quiet street. In the morning I bought a breakfast voucher for i think 89 baht as I'd not booked inclusive and enjoyed that very much. Every manner of fruit, stir fry rice, coffees, eggs, whatever your fancy. Upon leaving the friendly team at the long reception desk summoned a taxi for me in no time. Wonderful place if ever just passing through. Thank you. 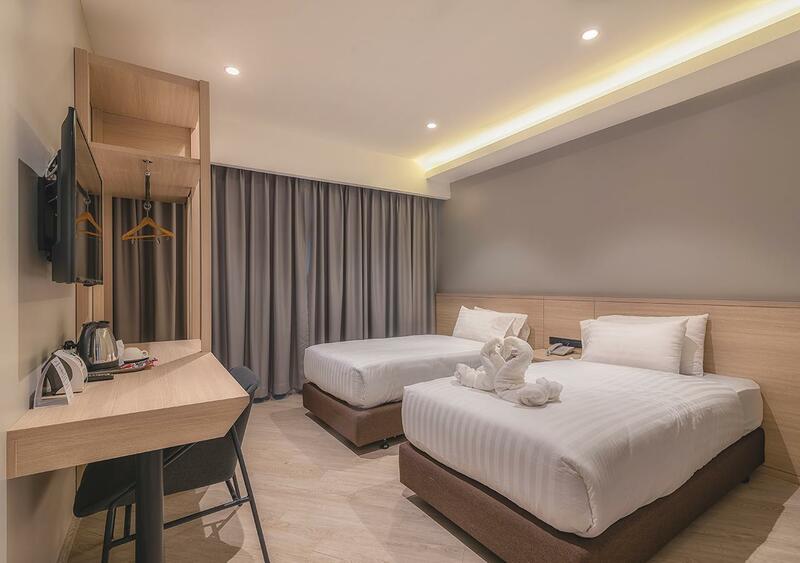 I booked the rooms last minutes after i reach Korat at late night and the price are cheap, Many rooms available but don't expect high quality from this hotel as it was not a newly builded and it also located near local night life and slightly away from main road. It's conveniece to do business when u want to go to have meeting with customer or shopping. But staff has difficulty to deal with. No smile at all. Food is not bad, suitable with price. Easy to go to have local meal there. Quiet and nice service from the hotel. The location is easy to transportation and shopping area. 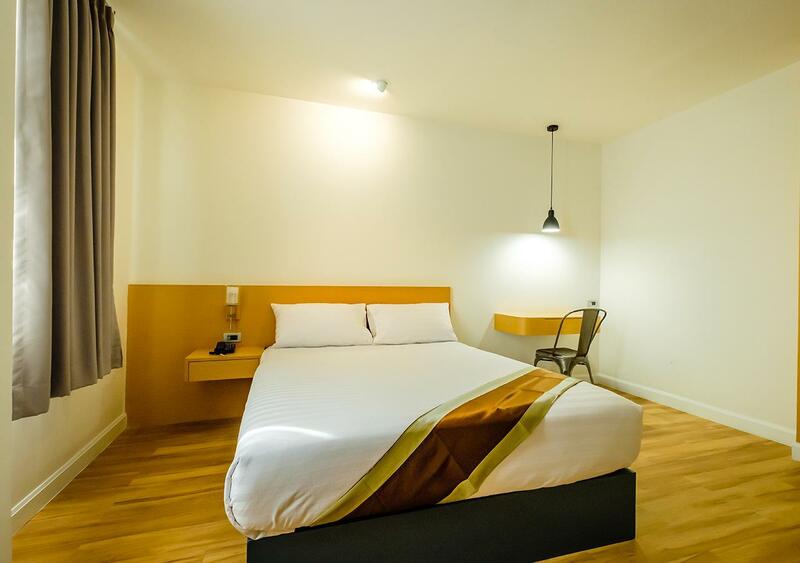 This hotel is located in the goods area, easy to transportation and shopping area. Around that there is a market which u can enjoy eating and shopping foods there. Nice local foods there with cheap price. This hotel is worth of what u pay. Also quiet place, u can have more time to work and thinking in your business. Breakfast food is ok, not bad. If i plan to go to here, I will come back again.